We’ve had some inauspicious nights in Europe before, but last night is surely up there with the most disappointing and dispiriting of them all. Anyone who thought Monaco were going to be an easy touch obviously wasn’t paying attention to what they do, but that we made it so easy for them was Wenger’s Arsenal at its self-destructive worst. Having scored just 4 goals in the group stages, they got 3 last night meaning that for us to go through we’ve got to do at least that when we visit them in a few weeks time. Based on their defensive record, and our ineptitude in front of goal last night, that’s going to be a tall order indeed. The night began quite well for us with Danny Welbeck fashioning a chance for himself in the opening minutes, but at this level you need to make them count. His turn was superb, his shot over the bar from close range just not good enough. There was a Gibbs cross just cut out before it reached the striker again, and a dashing Cazorla burst into the box but he pulled it back for Welbeck when he might have shot. Still, it looked promising, certainly not a taste of what was to come. Monaco rode the pressure, dug in, we ran out of ideas and any craft or drive about our performance ebbed away. It returned briefly with a nice move which saw Alexis shoot over before Giroud put one over the bar from close range after a low Bellerin cross (I think in mitigation there was a slight touch from the defender before he hit it – but was portentous to say the least). The missed chances came back to haunt us when we weren’t strong enough to win a 50-50 on the wing, Kondogbia was allowed too much room in midfield and although his shot took a slight deflection off Mertesacker, Ospina stood rooted to the spot as the ball flew past him to make it 1-0. It was an odd piece of non-goalkeeping. We needed a response in the early stages of the second half and ,as bad as it was by the final whistle, we should have had one. We made chances, it’s just that the chances were spurned. 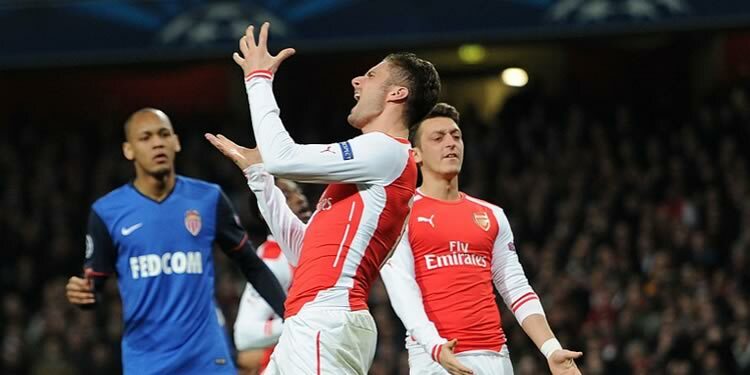 Olivier Giroud has been in cracking form for us lately, but quite what happened to him last night I don’t know. Everything he did with the ball last night, he did badly. Passes didn’t work, he’d lay it off to nobody, and his finishing skills deserted him completely. He couldn’t make proper contact with one at the near post after great work by Alexis, he planted a free header over the bar from a Cazorla free kick, and before he could miss again Monaco scored. Alexis lost the ball, Mertesacker’s decision to try and win it high up the pitch was the wrong one but you have to ask questions of the team in general when Berbatov – a man who makes sloths look like Ben Johnson – has that much time and space to tuck the ball away beyond the flailing Ospina. Our response was to create a move from which an Alexis shot fell to Giroud 8 yards out but he blasted it over the bar and was almost immediately removed from the action. I felt frustrated by him but also kind of sorry for him because for a player to be as bad as he was last night was almost impressive. 8 goals and 3 assists in 11 games saw him a confident, reliable, threat – after 60 minutes last night he looked a broken man. Theo Walcott replaced him and was involved in one piece of action from which he probably should have scored, before inadvertently blocking Welbeck’s follow up, but he then disappeared into a sea of blue shirts for the rest of the game. Alex Oxlade-Chamberlain tried to make things happen but his display was remarkable in that he scored a quite brilliant goal but almost everything he else he did involved giving the ball away. However, the big frustration of the night for me was their third goal. As bad as we were, and we were very bad indeed, to have scored in injury time with just minutes to go, should have been a lifeline in this tie. Taking a 2-1 defeat to Monaco would not have been easy but it would have left the tie relatively open. Instead, we took the lifeline, handed it back, and donned a pair of concrete boots. Going mad to get a second goal we left ourselves open and exposed, Oxlade-Chamberlain lost it, Koscielny was too high up the pitch, they broke and scored off the post and again I think the goalkeeper should be doing better there. It was, as the manager described it afterwards, ‘suicidal defending’. On a night when you should count your lucky stars you even got one goal, you should take it and make sure you don’t do anything stupid. Collectively, the team had a brain melt. Monaco were dangerous on the break for the whole of that second half, why on earth would we give them the chance to hurt us again? The decision to sit back, keep shape and take the 2-1 might not have been popular, but it would have been the right one in the context of that game. To concede again in the last seconds was pathetic, stupid, exasperating and so typically Arsenal. It turned what would have been a difficult job in the second leg into an almost impossible one. We now have to score at least three goals against a team who, from my cursory research this morning, haven’t had that done to them at home in a very, very long time. Whatever about seasons past when we’ve been diddled by top teams like Bayern or Barcelona, to fail against Monaco feels infinitely worse. At least with the others you have the ‘excuse’ of pitting yourself against the best players in the world but with no disrespect to last night’s visitors who played very well and took advantage of our shortcomings in a fantastically efficient way, to be taken apart the way we were on Europe’s biggest stage was little short of embarrassing. Mentally we were not ready or sharp enough to get into this game. We paid for it. In the first 20 minutes there was enough room to win the game. Monaco are a team who are strong physically with a good physical density and we missed the chances. If you look at the number of chances we missed, at that level you cannot afford that. This is a game of 180 minutes and if you look at the second and third goal, it’s difficult to explain how we conceded these goals. You cannot afford that. Perhaps, if you’re not ready or sharp enough, that’s why you concede the second and third goals. If the team lost sight of that so early in this tie, if they weren’t prepared properly for a game against Monaco, then that’s down to the manager. It always is. I mean, he can’t legislate for a player having a night like Giroud did, but at the same time we seem to lose common sense too often for it to be an issue handily pinned on the men on the pitch alone. If they feel a pressure to get something from a 180 minute game in 90 minutes where does that come from? Are they too easily swayed by a frustrated crowd, or is it in the team’s instruction from the bench? It’s difficult to take any definitive conclusions from last night but after that good spell in January when we played well for a bit, we’ve slogged our way through games like Leicester and Crystal Palace. The warning signs were there. As much as anything I think we miss genuine central midfielders to give the team proper balance. When you play all those forwards and do what we did to Boro it’s lovely to watch, but it’s clear that won’t cut it against better opposition. We got away with it against those two teams, we got found out against Monaco. We need Wilshere, Ramsey or even Arteta in there to help control the game both with and without the ball. We’re stretched because of injury, but lack of presence in that area of the pitch was, for me at least, one of the big issues for us overall. It’s been difficult to impose ourselves in recent games, and last night was more evidence of that. So, now what? We’ll get the usual post-match reaction stuff which, if you’re tired of hearing about learning or not good enough and all that, I suggest you ignore lest you give yourself an ulcer. The reality is we’ve taken a massive thumping and we have to ensure we’re not punch-drunk for Everton on Sunday. Good luck with that. Till tomorrow.